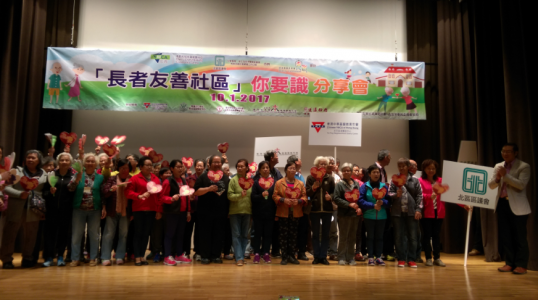 The Government of the Hong Kong Special Administrative Region of the People’s Republic of China endeavours to develop the Region into an age-friendly place and to promote active ageing. For the whole Region, policies and programmes have been developed for enhancing the well-being of older people and encouraging them to lead active and healthy lives, in areas ranging from retirement protection to medical services and community care and support services. The North District is one of the 18 administrative districts of the Hong Kong Special Administrative Region. Broad policies and programmes targeted at older people of the whole Region apply in the North District. At the District level, medical and recreational facilities are in place to meet the needs of older people (and other segments of the community). Social welfare institutions serving specifically older people are also in place, providing a wide range of services (such as out-reaching services, residential care services and day care services) for the older generation in the District. The North District Council of the North District is a body of elected representatives responsible for overseeing and advising on the delivery of public and social services in the District. The North District Council has established a dedicated Working Group on Age-friendly Community Network to co-ordinate the delivery of related services and initiatives in the District and map up a strategy and an action plan to make the District more age-friendly. The Working Group comprises members of the North District Council, representatives from relevant government departments, non-governmental organizations that deliver community support and elderly services, and a couple of Elderly Ambassadors who are lay older people keen on improving the well-being of their fellows.